Lake Champlain Great Camp - Rustic Luxury, Sunsets, Lawn, Beach, Amenities! The Camp at Barney Point…the perfect place for family vacations or multi-generational retreats! Outstanding 2,700 sf Lakefront “Adirondack Great Camp”, available seasonally, May to October. This Camp, or lake house, is an architectural “wow”, reflecting a careful, modern renovation while maintaining its historic, 1920s character. The Camp is located at Barney Point on Colchester Point Road, Colchester, VT, on the broad portion of Lake Champlain, with spectacular views to south and west, lake breezes, and picture-perfect sunsets. The property offers almost an acre of manicured lawns, stone walkways, and great landscaping, with two hundred feet of cliff-top lake frontage and panoramic views. Kids and adults alike will enjoy the huge, green, lawn (with pop-up sprinkler system) for dining, lounging, croquet, volleyball, ping pong, softball, tag or other games. Sit, read, and relax. Lay in a hammock. Sit back in a comfortable Adirondack chair at the cliff's edge and watch the fun of the season on the water in front of you. What you’ll notice about the Camp at Barney Point is that it offers plenty of space for family time, inside and out of doors. Walk the 2-3 minute meandering path through the woods to the association beach—with amazing southerly views to the most expansive section of Lake Champlain—great for bonfires and gatherings. The lake access here offers clean, shallow water and a sandy bottom—great for kids. Are you looking for an opportunity while on vacation to actually use the lake instead of just gazing at it?! This vacation destination includes numerous amenities that you'd typically find only at an all-inclusive summer resort. Use the Camp’s guest boat mooring, swim platform, rowboat, paddle board, floats, or 3 kayaks. Paddling along the shore to explore the bay, Law Island, and the tip of Colchester Point to the north - or the Winooski River and Burlington Bay to the south - are sure to delight guests of all ages. Or walk, run or bike the Island Line Trail, a 5-mile scenic wonder, offering access points adjacent to The Camp. This continues north to South Hero, VT when the bike ferry is running, or south to Burlington, another 7.5 miles of scenic beauty! Wonderful Airport Park is just down the road, offering tennis, basketball, a historic schoolhouse (hours vary), and running trails - great for adults, kids and pets. The Camp sleeps 14 - a king bed in the 2nd floor master with direct access to a master bathroom with soaking tub overlooking the lake; 2 twins in a 2nd floor bedroom; 4 twins and a double in the 3rd 2nd floor bedroom; a double in the 1st floor bedroom with direct access to the 1st floor bathroom; and 2 twins in the main living area that by day form a seating/lounging area for games and reading. The Camp offers an amazing kitchen with dishwasher, pantry, gas range, fridge with freezer and ice maker, and utensils/dishes for the largest of gatherings, as well as Silestone bar/seating for 8 in a u-shape. A full W&D is offered on the 2nd floor. (All appliances were new for the 2013 season). The Camp has 2 bathrooms, each with shower. The main en-suite Master bath also has a vintage soaking tub overlooking the lake. The main floor gathering areas offer ample seating for dining, conversation and games. There is a large, wooden dining table with seating for 10-12. In addition, there is 'living' seating for about 20 more. Views abound from every room, with the screened and outdoor porches and decks offering an extension of the gatherings inside. Recent additions include all new outdoor composite dining and Adirondack seating. Ample off-road parking is offered, as is a great deal of privacy. Warm up in front of the wood stove, framed by the Camp’s original brick chimney, on those cooler evenings. We are Marilee & Burt Willey, and we are pleased to welcome you to the Camp at Barney Point. We, along with our 3 kids, know you will find this location special for your next group or family getaway! Finding a great spot on Lake Champlain with outstanding views, luxury, parking, beach access, water crafts, a guest boat mooring, a private swim raft, a long list of included amenities (4 kayaks, 2 paddle boards, row boat, outdoor ping pong table, croquet, bikes, and so forth...) and room to play is key to any group or family getaway. The views are outstanding; the lawn and upkeep is top notch. This location has it all. The interior offers unparalleled rustic luxury. The outside offers unmatched beauty, useful spaces, places to play and "postcard" lake and sunset views. We wanted a property where we could offer more to guests than they might have expected - this property offers true differentiation. The quality and careful renovation of the Camp is a true differentiator as well. Sleeping for 14 offers space for multi-generational gatherings. Rustic, yet luxurious. Spacious, yet cozy. An outdoor scene unsurpassed on Colchester Point. Far away, yet close to everything - 10-12 minutes from downtown Burlington. Relaxing, yet offering sports opportunities galore. Get away from it all at the Camp at Barney Point. toilet, tub, shower, Separate vintage soaking tub from tiled shower. Lake view. toilet, shower, Access from 1st Floor Master bedroom and kitchen/living. Owner provides soap, shampoo, conditioner, and paper products. Private Association Beach at Property. South-facing. Shallow, clean, sandy lake bottom in bay. Sandy beach access with some shale. Boat mooring. Swim raft! 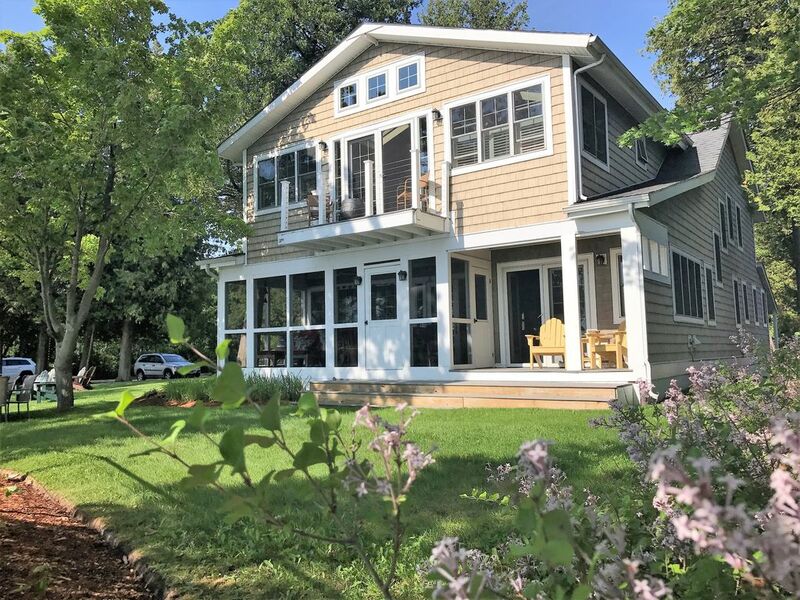 Southerly and Westerly Lake Champlain Bluff-Top Setting with Commanding NY Adirondacks & Sunset Views. You can see Lake Placid, NY from the front deck and lawn. Direct beach access from property; path to beach. Off of 2nd floor master. 3 kayaks, 1 paddleboard and a rowboat are available to guests! 3!! 1st: covered, open air, faces lake. 2nd: screened with seating and table, faces lake and lawn. 3rd: large, open air, faces lake and large manicured lawn. Tubes, chairs for beach, and other beach/lawn toys are available to guests! Huge lawn for games, croquet, volleyball, parties. Path to association beach with shallow water with sandy bottom. Great for kids! We and our guests loved our weekend here in early October. The back yard offered stunning views of autumn colored hills across the lake. Despite some wind, rain, and chilly temperatures, we were kept comfortably warm by the heaters and fireplaces. Initially we had some concerns about this, but Burt responded immediately to provide additional space heaters. These turned out to not be especially necessary, but they were good for regulating the temperature for a couple of or Florida-based guests. Ultimately we were plenty warm, for anyone wondering wondering about renting later in the year. The house itself was provided with all the amenities we needed, including lots of little basics we thought we might need to bring for ourselves. One minor note for large parties: the two beds in the living room area are basically daybeds arranged in an L-shape in the corner, and were a bit close together for two of our adult guests. Otherwise, the kitchen was great for cooking, the beds were comfortable, the furniture was in good condition, and the host is friendly, accommodating, and very responsive. We made many wonderful memories there, and we would enthusiastically recommend the cabin to anyone! Wonderful property with a beautiful lake view. This property was perfect for our group (8 adults and 3 kids). The location is great and the lake views are spectacular. We all utilized the provided equipment especially the grills, fire pit, bikes, stand up paddle boards, and kayaks. I would absolutely stay in this property again. I only have one minor suggestion. Please consider replacing the internet router. There were many times when the internet did not work or was very slow. We were not streaming videos or anything like that, just normal use of our phones to plan our vacation days. Other than that, I have nothing but high praise for the property. Wonderful well appointed property with beautiful lake views, plenty of space inside and outdoors. This stunning spacious property is perfect for families to gather together. The Camp is decorated with an eclectic collection of wonderful "stuff"! We were impressed with the comfy beds and the quality of the linens and towels. The kitchen is supplied with everything one could possibly need to prepare great meals, and the lake house has several seating areas to enjoy those meals. A broad sandy beach is accessible by a few minutes walk through the woods. There are ample water "toys" as well as equipment for lawn games in the spacious beautifully maintained yard. We would highly recommend the Camp. Our family had a most enjoyable time there!! Everything our family desired for our time together. Excellent equipped summer cottage, made almost all meals the entire week onsite (did not want to leave) , enjoyed the water toys and swim platform several times a day, and the bike path is so convenient. Only downside is the property is so wonderful, we did little traveling to any other diversions! Our family certainly wants to visit again. Thanks to the Willey family for equipping this slice of heaven so well. My family and I had a wonderful time at your beautiful "camp." I have a reputation among my family for finding beautiful vacation spots through VRBO. A villa in Joucas, France over looking the Luberon Valley, a rooftop apartment high above Vancouver, a seaside cottage over looking Perkins Cove, Maine and now your fantastic place with 180 degree breathtaking views of Lake Champlain. We have friends and family that are local to Burlington that dropped in to visit and were amazed that we found such an incredible place. It was a perfect spot for our large group with so much room for playing, entertaining, relaxing and watching some of the most incredible sunsets ever. The beach is so close and was a wonderful surprise with its sandy beach and large expanse of shallow water for our 4 small grandchildren. It was a vacation that we will always treasure in our bank of family memories. Thank you for sharing! We rented the home for a family vacation to surprise my mom for her 70th birthday. This was our first time vacationing on Lake Champlain. We were delighted upon arrival to find that the house was even better than we had anticipated. The yard is absolutely lovely with tons of space for games and relaxing. The views are incredible and the yard has lovely big trees and lots of seating areas. The outdoor furniture is clean and comfortable and the yard is beautifully maintained. The house itself is delightful with tons of charm and plenty of amenities. The kitchen is very well stocked and had everything you could possibly want including a great waffle maker and blender. The beds were super comfortable and the linens and towels were all nice and high quality, The house is cozy but accommodates a large group well because of all the different nooks and seating areas. We really loved the house and can't imagine finding a better place with beach access. The water was warm and the fishing was terrific - right off the beach and rocks. Hope to return again! The Camp at Barney Point is located on the broad portion of Lake Champlain about 10 minutes north of Burlington, VT. Within a short driving distance, guests can reach Montreal, Shelburne, Stowe/Sugarbush, the NY Adirondacks, and many other scenic and tourist-oriented areas. During The Camp's 'season of availabililty' - May to October - there are many local and regional festivals, markets and attractions. We publish a complete PDF-based 'Guide to The Camp' to include all such information for guests. Rates shown are subject to change; VT 9% lodging tax and Town of Colchester 1% tax and cleaning fees are additional, subject to size of party.